Thankfully, over the past several years gift shops at Universal have become better themed and well merchandised, and several have even started to incorporate interactive features for their guests. It’s almost unbelievable to say it, but just as Harry Potter and the Forbidden Journey became possibly the first attraction in the history of theme parks to have a queue guests wanted to spend more time in, gift stores themselves are becoming features of attractions that guests can look forward to experiencing. Here now, a look at 6 of the best gift shops at Universal Studios Florida. Despite the great joke mentioned above, the Simpsons Ride is one of the few attractions at USF that doesn’t exit into a gift shop. The Kwik-E-Mart, the ride’s merchandise location, is right next to the attraction and is filled with the high level of self-deprecating humor that is found throughout Springfield USA. Signs above the merchandise include sales pitches like, “Today’s merchandise at tomorrow’s prices!,” “These items won’t buy themselves!,” and “C’mon! If you owned a store we’d buy your junk!” There’s even a sign at the registers that has a call back to an episode of the Simpsons television show as it warns the cashiers not to take checks from various people including Chief Wiggum, Homer J Simpson, and Homer J Fong. The walls and outside windows of the Kwik-E-Mart are laden with ads for fake products including Farmer Billy’s Choco-Bacon-Bars (“It’s like chocolate and bacon had a baby in your mouth!”) while the variety of actual Simpsons related products inside includes t-shirts, hats, plush, comic books and more. 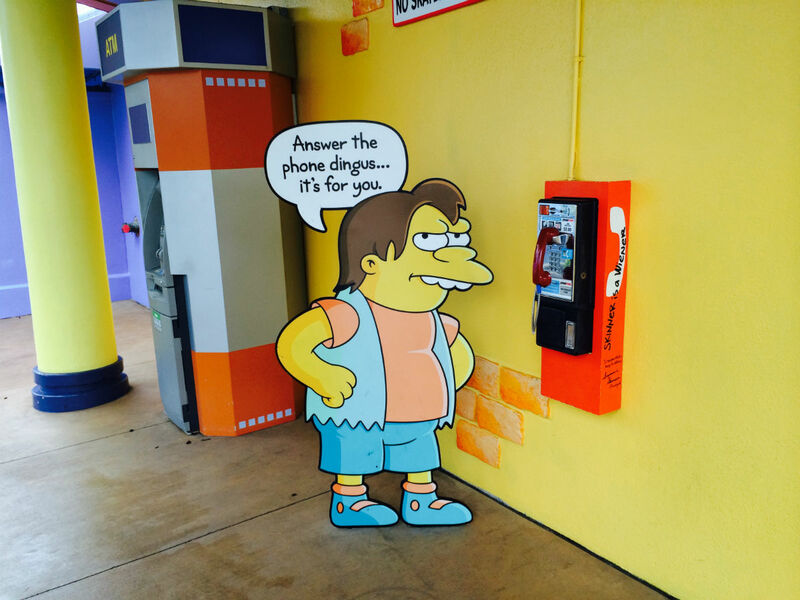 Outside the store there is a photo-op available with Milhouse sitting on a bench and one of USF’s most hidden gems, the Simpsons pay phone. On the side of the Kwik-E-Mart closest to the Simpsons ride, there is pay phone mounted on a wall with the character Nelson next to it with a word balloon saying, “Answer the phone dingus…it’s for you.” Walking by this phone will trigger it to ring, and picking up the receiver will treat you to a gag line by one of the various Simpsons characters including Chief Wiggum, Moe Szyslak, and Bart Simpson. 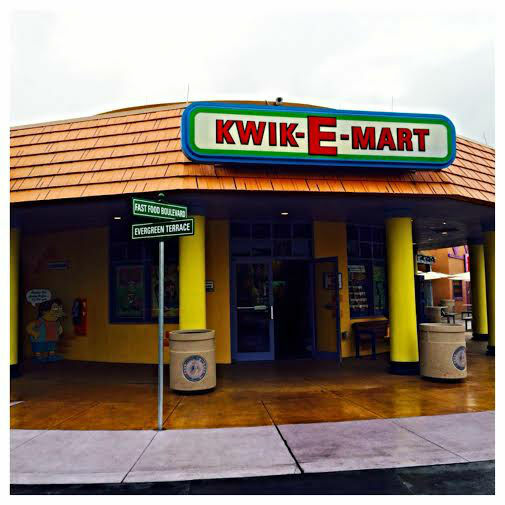 With a pressed penny machine, the Big Pink donut, and lithographs of the hilarious attraction posters such as Captain Dinosaur’s Pirate Rip-Off (a jab at Disney’s Pirates of the Caribbean ride), the Kwik-E-Mart is a must-do for any Simpsons fan. The T2:3-D gift shop is teeming with an incredible amount of “geek” merchandise. Actual Terminator-themed items make up about 10% of what is sold in the store, and almost every other popular Sci-Fi or cult hit is represented throughout. 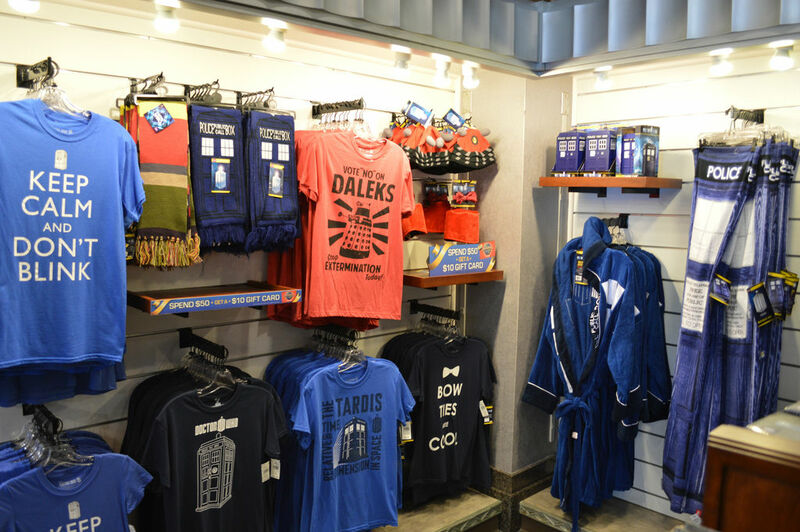 Franchises including Dr. Who, Battlestar Galactica, and even Star Wars have products ranging from action figures to hoodies. the T2:3-D store also fills the role of the Marvel comic store located in Island of Adventure’s Marvel Superhero Islandwith its wide variety of DC comic books to purchase, including Walking Dead graphic novels. There are some very impressive Terminator props in the store as well, including a life-size T-800. If you’re the type of person who looks forward to the upcoming Daredevil series on Netflix, watched the Day of the Doctor simulcast, or knows who Hershel Greene is, you’re going to enjoy shopping in the T2:3-D gift shop. 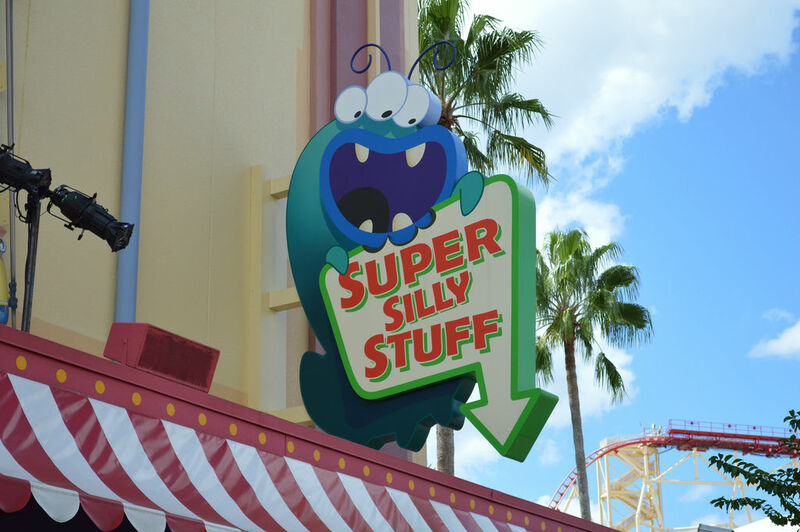 Super Silly Stuff is the gift store you exit into after riding Despicable Me Minion Mayhem. Everything Universal did for the Despicable Me attraction was perfect: the outside recreation of Gru’s house, the wonderful propaganda-style posters along the show building, and so many other details. The multiple pre-shows and the ride itself are fantastic and the Super Silly Stuff is a store loaded with great Despicable Me products to purchase. I don’t want to spoil the attraction for anyone who hasn’t had an opportunity to ride it yet, but there is something that is key to the end of the ride that you can actually buy in the store, which I think is a great touch. There are the plushes available for all the main characters of the film, including Gru’s dog Kyle. You won’t be able to go one foot without running into a Minion-related product, whether it be t-shirts, plush, notebooks or bottles. Just as the store has an item relating directly to the attraction, there are several products which will have great appeal to die-hard fans of the Despicable Me film. My favorite is the recreation of the Girl Scout cookies that Gru’s daughters sell to the villain Vector. 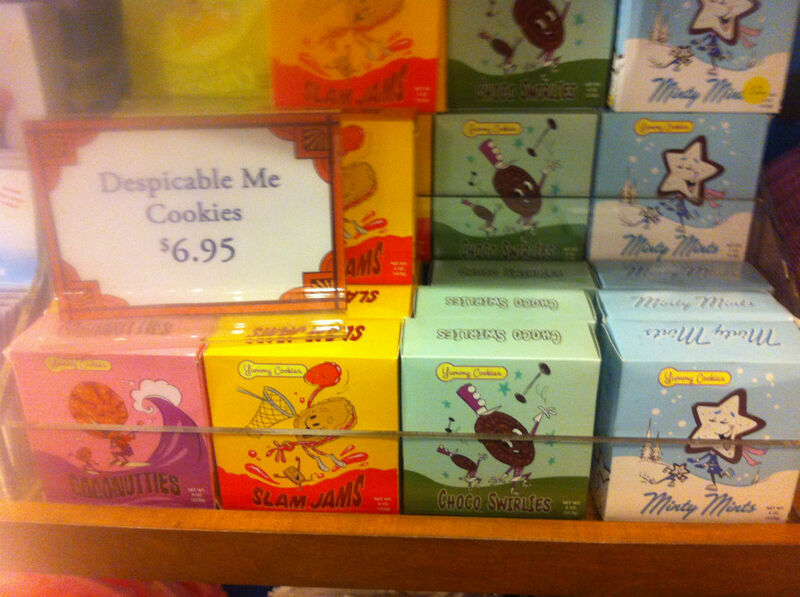 That’s right, you can buy Choco Swirlies and Slam Jams, two types of cookies that only exist in the Despicable Me universe. 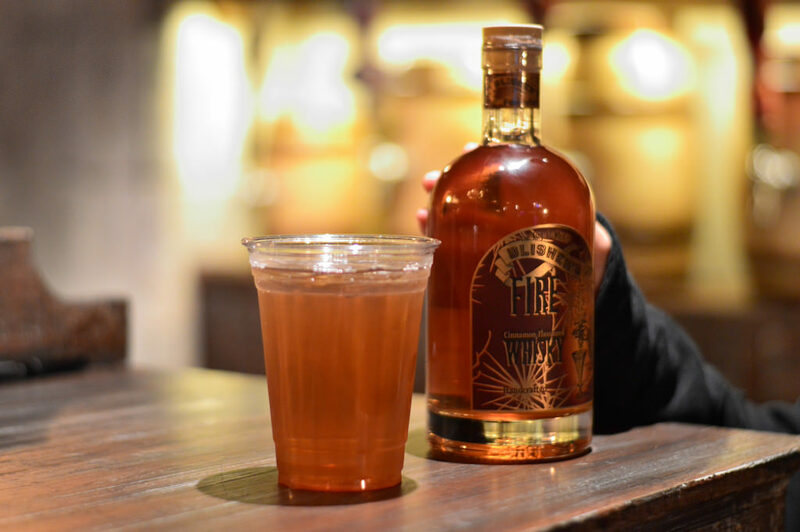 Whether it’s getting a Butterbeer at the Wizarding World of Harry Potter or a Duff Beer and Krusty Burger at Moe’s Tavern, Universal is delivering items straight out of our favorite movies and television shows. For years it seemed theme park fans had to watch as merchandise became more and more generic but clearly Universal is going the other direction and almost over-delivering to its fan base with some really sharp and well thought out products. 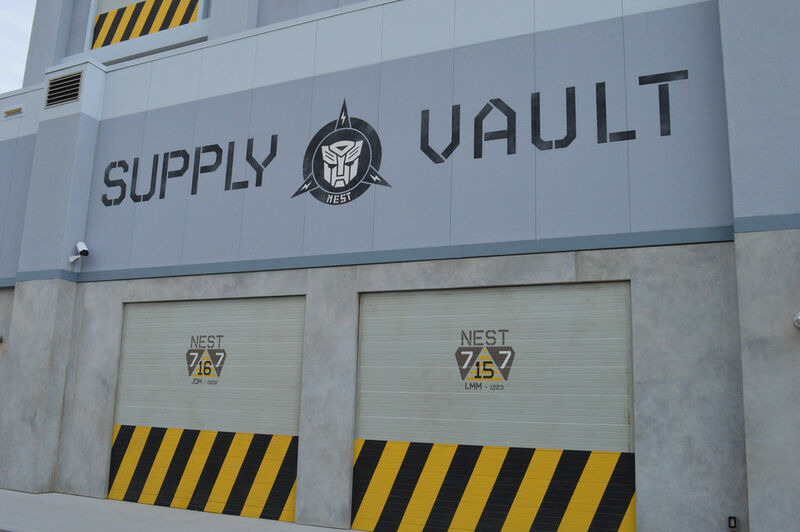 The Supply Vault is located at the end of Transformers: The Ride-3D. The atmosphere of this store is huge highlight for me. The cashiers are all N.E.S.T. soldiers, you have the entire military complex theme throughout, and you can hear the amazing Transformers music playing outside the building. 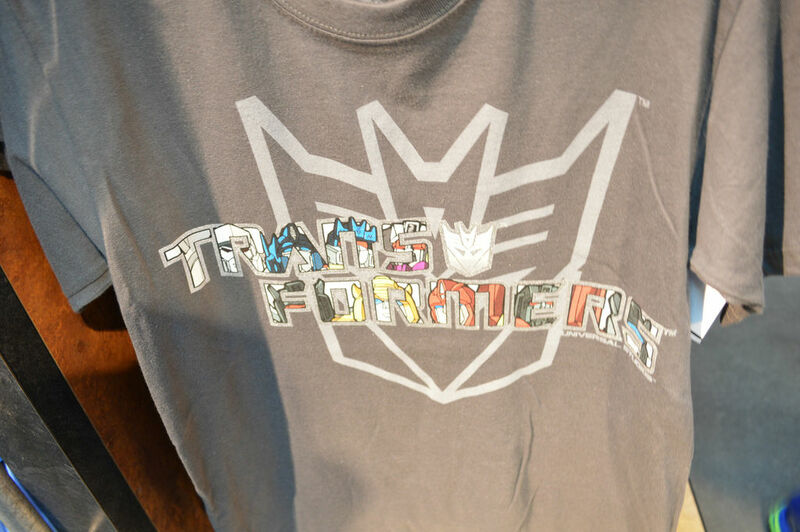 As a fan of the Transformers growing up, the merchandise inside floored me. My favorite item is the exclusive Transformer figure Evac that you can only buy through Universal. Another must have item is the insane chocolate Allspark, a solid piece of chocolate that is very reminiscent of the Borg ship from Star Trek. One of the highlights of the Supply Vault for me is the mix of merchandise for both the new Michael Bay versions of the Transformers and the old 1980’s Generation One versions. While the new “realistic” version of Transformers is impressive to behold (and they help make the attraction itself amazing) there is something to be said for the old 2D animated Optimus Prime, Bumblebee and Megatron that we all fell in love with in the first place. T-shirts, hats, and toys are available. As a fan of pressed pennies, I was also very happy when a new penny machine arrived with some of the most intricate designs available in either park. One of the pictures simulates the experience of the E.T. 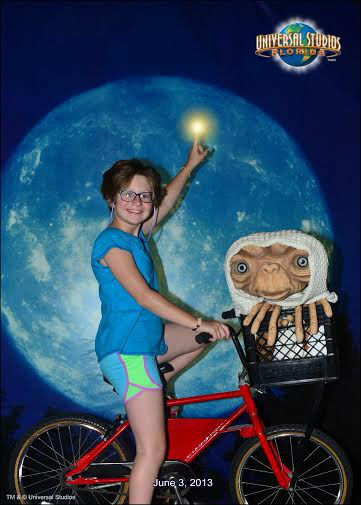 attraction itself as you are get a chance to “ride a bike” with E.T. For anyone who has seen Spielberg’s film, Elliot riding on the bike with E.T. is going to evoke a good memory. The other photo takes another iconic moment of the film, E.T. being dressed up, and allows several guests to be able to take their picture with E.T. in the toy closet itself. I don’t know what it is about the E.T. Adventure, but it is an experience I really enjoy. I’m not the biggest fan of the original movie and the wait to get an “interplanetary passport” at the beginning of the attraction drives me crazy, but once I walk into that indoor forest queue, I’m hooked. I love the queue, I love the ride, and I love this gift shop. Now THIS is a a gift shop. 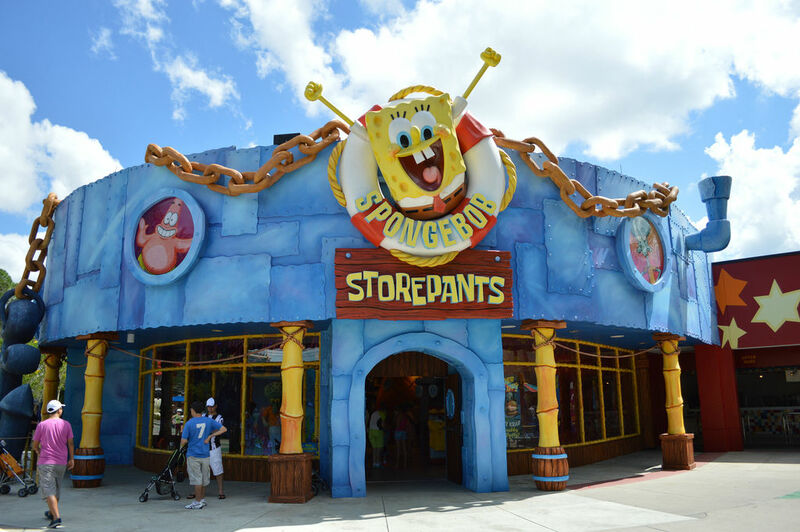 SpongeBob Storepants opened in May of 2012 and contains everything you could want in a gift store, despite the fact that SpongeBob himself has no attraction in the park (Squarepants and his pals are a part of the Superstar Parade.) As with the long-running SpongeBob cartoon series, the store caters to children but there is much for adults to enjoy as well. 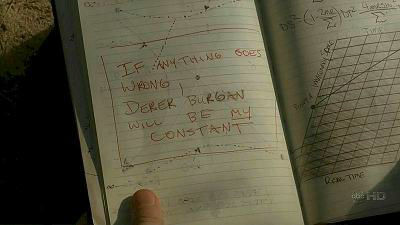 Similar to the Simpsons, the Spongebob brand has a very smart wit about it and can work on several levels. 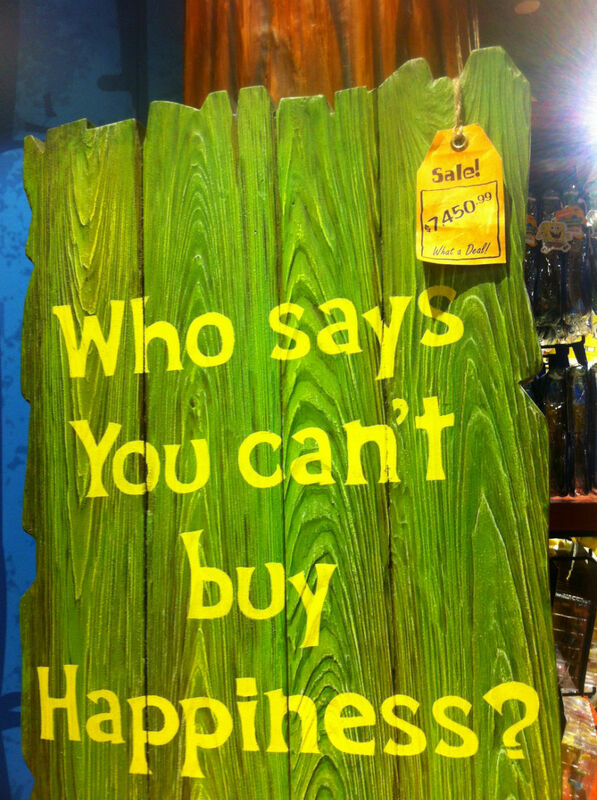 One of my favorite jokes in the store is a simple board that has the phrase “Who says you can’t buy happiness?” painted on it. Upon closer inspection, the board sells for $7,450. The outside of the store sets the show with a facade that looks straight out of the cartoon. The exterior has what looks like large pieces of metal welded together and supported upon bamboo poles that sit in barrels or crates. A running theme throughout this store is Mr. Krabs and The Krusty Krab, so you’ll see posters showing Spongebob himself making some crabby patties or signs mocking Mr. Krabs’ crass commercialism. At the front of the store is a dedicated meet n’ greet area where you can have you picture taken with characters such as SpongeBob, Patrick and Squidward. Once you pass that, the theming inside is bananas and almost transports you to Bikini Bottom itself. Like the Kwik-E-Mart there are tons of sight gags and jokes all around the building as well as representations of many of the houses you’ll see in the show. The largest of these houses is SpongeBob’s pineapple which you can actually enter and get your picture taken with Gary the snail. There is so much to see and take in at SpongeBob Storepants its easy to forget it’s actually purpose: to sell you stuff. Tons of great SpongeBob merchandise here including a wonderful Build-A-SpongeBob toy. I recently wrote that guests should at least walk through Confisco Grille to see the incredible theming and SpongeBob Storepants is something similar. It’s worth a walk through this store even if you have no kids or have zero inclination to buy any merchandise. It’s an experience. If more gift shops were like this we’d be waiting for the rides to finish so we could hurry up and shop. 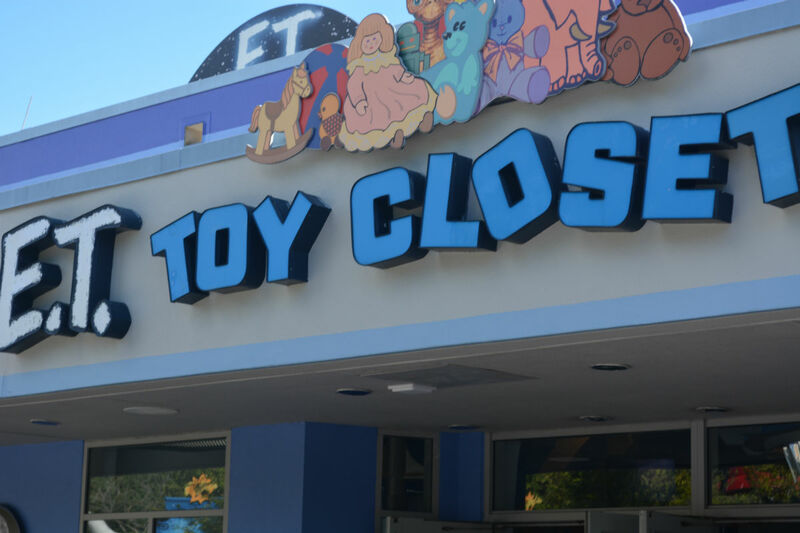 So there you have it: the top six gift shops at Universal Studios Florida. See you next weekend for the latest edition of the Saturday Six. If you had fun, be sure to check out The Magic, The Memories, and Merch! articles or, for your listening pleasure, check out Pardon the Pixie Dust podcast. Thank you for the Universal posts! Keep them coming!